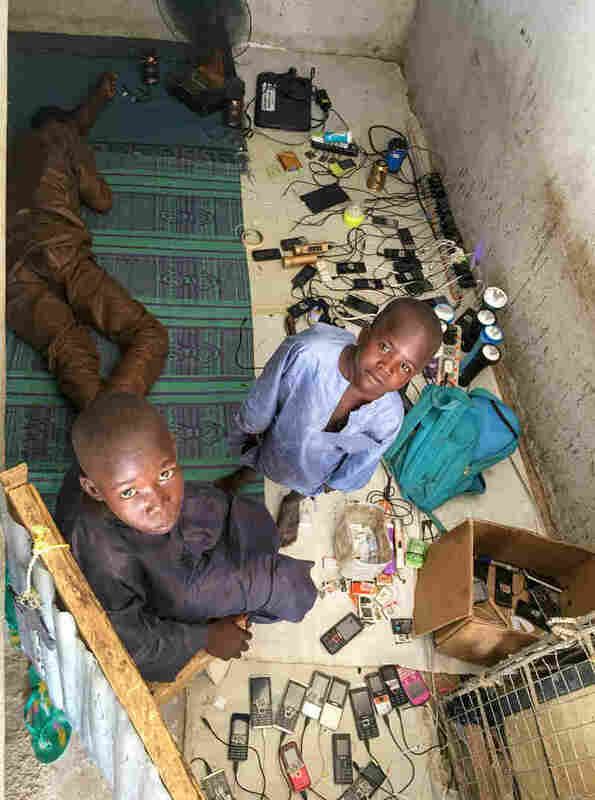 Displaced By Boko Haram, A Father Earns A Living Charging Cellphones : Goats and Soda A father of seven had to start over after his family was forced from home by the militant group Boko Haram in Nigeria. He found safety and a new job in a camp for displaced persons. 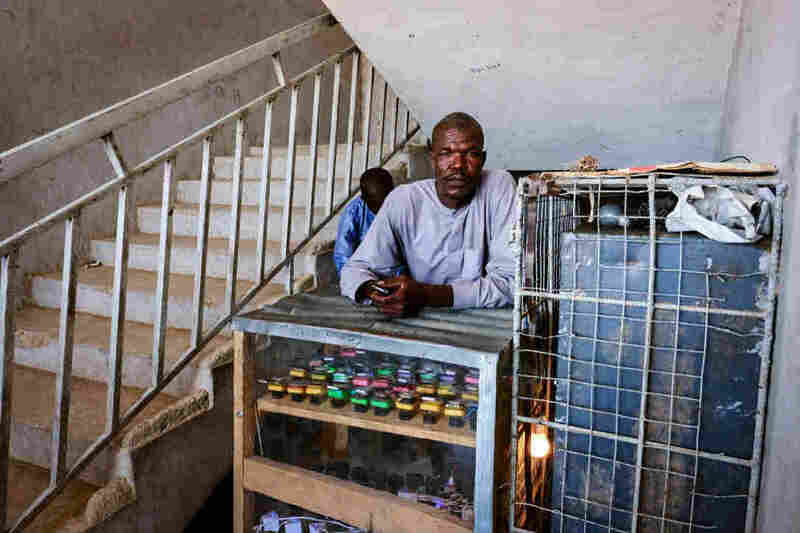 Modu Churi, who fled his village to escape the militant Boko Haram group last year, now earns a living by charging cellphones for displaced persons in northeastern Nigeria. Imagine the worst has happened to your family. You've been forced to flee your home. You eventually make it to safety. But now you're living in a camp for displaced persons. You don't want to just depend on handouts. So how do you make a living? That is what happened last year to 43-year-old Modu Churi, a father of seven from Mijigini village in Borno state in northeastern Nigeria, a region blighted by violence during the militant Boko Haram's eight-year insurgency. Now they live at Muna Customs House camp in Maiduguri, the main city in the northeast, along with more than a million and a half other people uprooted by the fighting. In his village, Churi had earned a living by charging and selling phones. He needed a new source of income. And then it clicked — he could attempt a similar startup in the camp. He noticed that people who had lost almost everything still had their cellphones and a few smartphones. "So I decided, OK, let me start up a little business and I thought about opening up a phone-charging point," says Churi, speaking in Hausa, the lingua franca of northern Nigeria. He says he used his life savings of about $160 to purchase a generator and set up what has turned into a viable little enterprise. The generator is essential because power cuts are common in Maiduguri. Churi is a tall man who towers over his makeshift booth. He has set up shop in the stairwell of an unfinished three-story brick building that has been taken over by persons who are displaced. He displays a few handsets for sale, plus colorful accessories to attract customers. From a half floor up, you look down on an array of mostly old-style cellphones splayed out on the dusty floor, plugged into an adapter fueled by the generator for a charge. Churi charges to charge the phones, earning money to look after his family. Three little boys peek out from beneath the stall as Churi tells his story. "Even here in Muna camp, I can earn money and care for my family," he says, looking at the children. "At times, when there's a market for this business, I charge about 50 phones. At times, up to a hundred phones a day." So how much does it cost to charge a phone? It's affordable, says Churi, 10 cents per phone. At times, he says with a smile, he makes nearly $13 a day. "Alhamdulillah. We thank God, the market for phone charging is good," he says. Churi dreams of heading home to Mijigini with his family. "I'm planning to go back home. Now I have the generator, so I'll use it in my village — because people will always use cellphones, yah." "I trust I'll do well continuing this same business once I'm back home," Churi says hopefully, flashing another broad and positive smile.